WASHINGTON — The leader of Iran’s elite Quds Force is contributing to instability in Iraq and complicating the U.S. mission against terrorism with his command of some of the Iraqi forces battling Islamic State militants, the director of the Central Intelligence Agency said. The comments by John Brennan, broadcast Sunday on “Fox News Sunday,” are among the strongest yet voiced by U.S. officials about the involvement of shadowy Gen. Qassem Soleimani in the war against the extremist group. Brennan described Soleimani as being “very aggressive and active” as he advises Shiite militias battling the extremists, mostly recently in the ongoing offensive targeting Tikrit, Saddam Hussein’s hometown. Brennan said he “wouldn’t consider Iran an ally right now inside Iraq” even though Iran and the U.S. both consider the Islamic State group an enemy. But Brennan said he didn’t believe the presence of Soleimani and his advisers pointed to Iran having a larger position in Iraq and its future. However, he acknowledged it’s not for lack of trying. Baghdad’s Shiite-led government has forged closer ties with Iran, its adversary in a 1980s war. 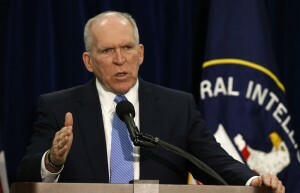 Brennan said the Iraqis themselves, not the pullout of U.S. troops, are responsible for the country’s insecurity. Iraqi security forces crumbled in the Islamic State group’s lightning offensive last summer. The militants now hold a third of Iraq and neighboring Syria in their self-declared caliphate. “I think the fault really lies with a number of the Iraqis who wasted and squandered the opportunity they had after the government was reconstituted not to put at rest some of these sectarian tensions and not to be more inclusive as far as bringing the Sunni community in,” Brennan said.